Welcome to the Jaw-Dropping Geography Series! Bestselling children's author Jess Roche presents "Jaw-Dropping Geography: Fun Learning Facts About Largest Lakes." 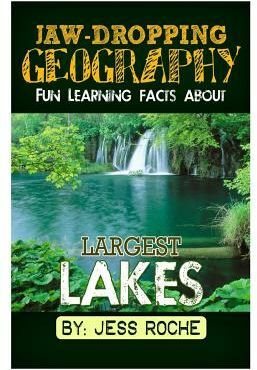 This book uses captivating images and expertly written words to teach children about " Largest Lakes." Perfect reading for any occasion and especially ideal for bed times, long journeys or for bonding with your child. Fun Filled Learning for Your Child (and you ) Every one of our books is lovingly researched, illustrated and put together to outstand, awe and inspire the reader. Our beautiful images help explain and enlighten each well-written fact. This book covers a range of exciting topics including: * Introduction - What Exactly Are Lakes? * What Are The Top Five Largest Lakes In The World? * Tell Me About Lake Superior! * Tell Me About Lake Victoria! * Tell Me About Lake Huron! * Tell Me About The Caspian Sea! * Tell Me About Lake Aral! * What About The Dead Sea - Is It A Lake? * Where Can I Find The Most Lakes In The World All Together? * How Are Lakes Made? * Why Are Manmade Lakes Formed? * What Is The Study Of Lakes Called? * What Is The Difference Between Ponds And Lakes? * Do Lakes Last Forever? * What Kinds Of Animals Live In Lakes? * What Kinds Of Plants Are Found In Lakes? * Why Do Humans Need Lakes? * What Are Some Fun Lake Activities? * What Are Some Lake Threats? * What Can We Do To Protect Our Lakes? We loved compiling this book and even learned a few things along the way and hopefully you will too. Get this book at this SPECIAL PRICE exclusive to the Amazon Store. *** Your child will love it - this is guaranteed. *** PLEASE Leave an honest review after reading this book! It REALLY helps us to understand what you would like to see and read about! Thank you.